Averaging 350 sunny days a year, Palm Springs is a favorite desert getaway in Southern California. 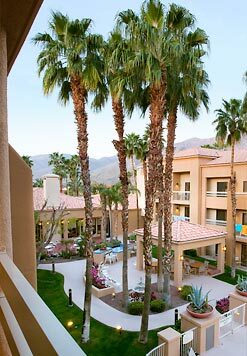 Our Courtyard Palm Springs hotel by Marriott puts you in the center of it all. From golfing at the 100+ golf courses throughout the valley to a trip up nearby Mt. San Jacinto aboard the Palm Springs Aerial Tramway, to shopping the 1050 retail establishments, guests can do it all from our hotel. Business travelers will enjoy their room's large work desks and free high-speed internet access which will make being productive as easy as possible. When it is time to relax, guests can visit our outdoor pool and jacuzzi or exercise in the on-site workout facility. We are also located just a mile from the airport and near some of the best restaurants and theaters in the area. 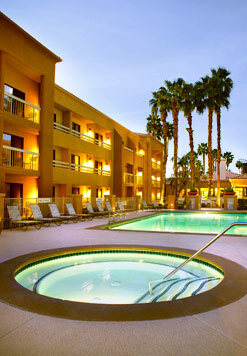 Our Palm Springs hotel is close to the Convention Center, restaurants, shops, and clubs downtown. Our Courtyard Palm Springs 24-hour market gives you access to sandwiches, salads, snacks, and drinks. To make a reservation to arrive up to 3 days pre or stay up to 3 days post BOOST Conference, please call the Courtyard Marriott onsite reservations department at (760) 322-6100- ask for Yolanda. You must identify yourself as being part of the BOOST CONFERENCE in order to obtain this special rate. - Complimentary shuttle service to and from the Palm Springs International Airport, only a mile away. The Hotel offers a 4:00Pcheck-in and a 12:00PM check-out. Hotel also offers express check-in and express check-out. - Complimentary WiFi throughout the hotel. - Refrigerator in every room.